…it’s time to get back to some regularly scheduled programming. 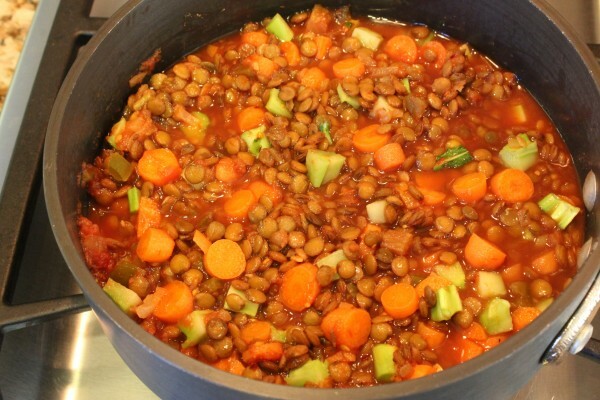 Here’s a one pot, gluten free, vegan meal recipe that is ready in less than 30 minutes, makes planned leftovers, costs next to nothing, and is hearty and satisfying. How’s that for killing seven two birds with one stone? 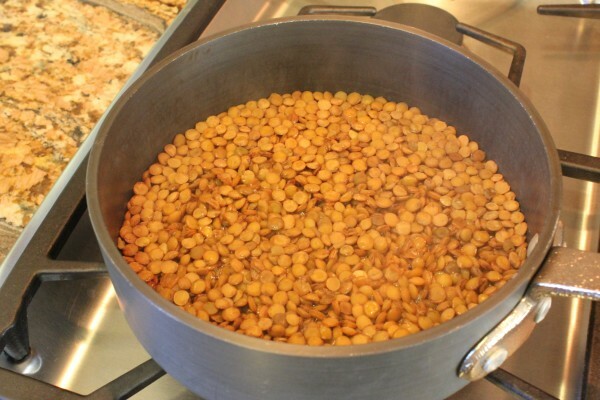 Cook 1 cup dry lentils with 2 cups water on stovetop (Bring the lentils and water to a boil, then cover and reduce heat). Simmer for about 15 minutes, or until about 85% of the water has been cooked off. Stir, cover, and cook for another 10-15 minutes. This was easy, fast, cheap meal when served next to a fresh green salad. Filling, hearty, satisfying. 30 Minute Meals anyone? 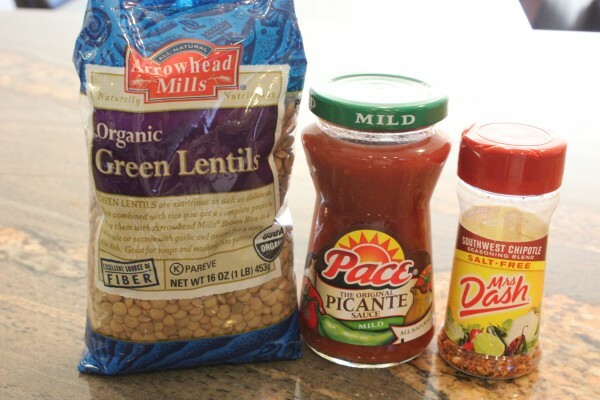 The salsa was a nice way to season the lentils because on their own, I find lentils to be quite bland and can even be “earthy” tasting. 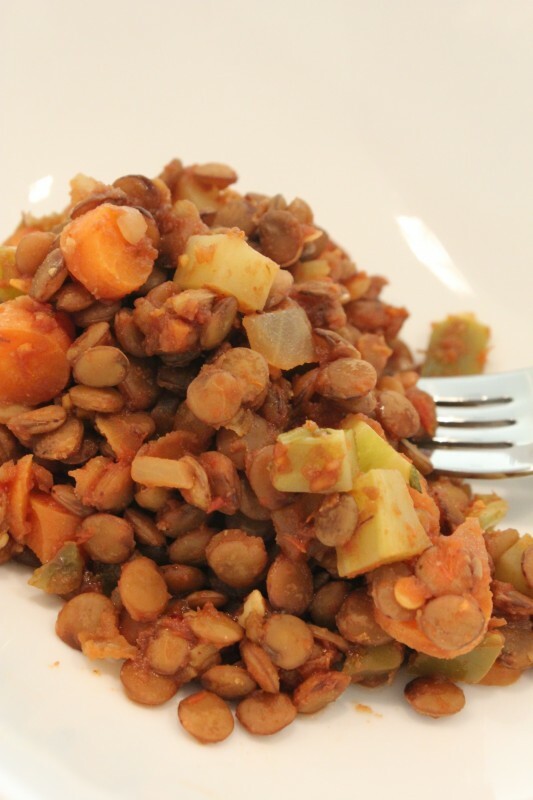 Scott had no idea he was eating lentils. His comment, “Whatever that was that you made was actually good.” He grew up a meat and potaotes guy so the fact that he dines on nooch (15 recipes here), raw vegan chocolate mousse made with avocado, and lentils, well, he’s come a long way. I’ll take an “acutally good” any day. 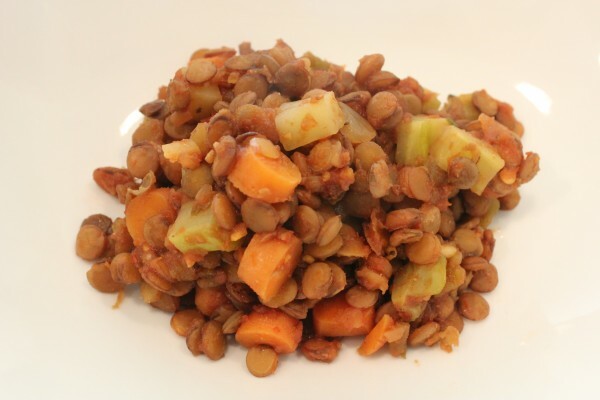 If you’ve never cooked with lentils before, just make sure to not overcook them. 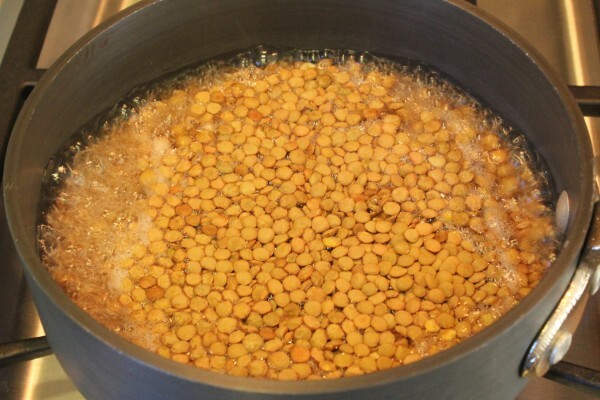 Red lentils cook very fast and can turn to mush easily and you can end up with (unplanned) lentil soup on your hands, quickly. 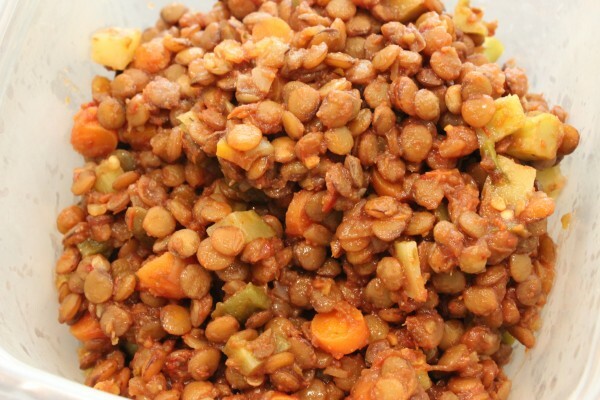 Green and black lentils take longer to cook, but this whole meal, from start to finish, was done in 30 minutes. 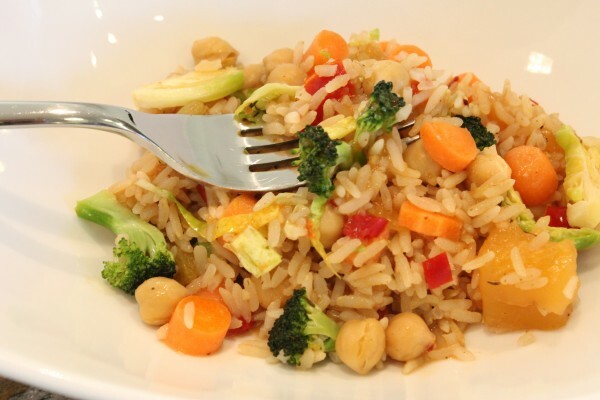 The added veggies gave some color, a bit of extra texture and crunch, and more fiber. 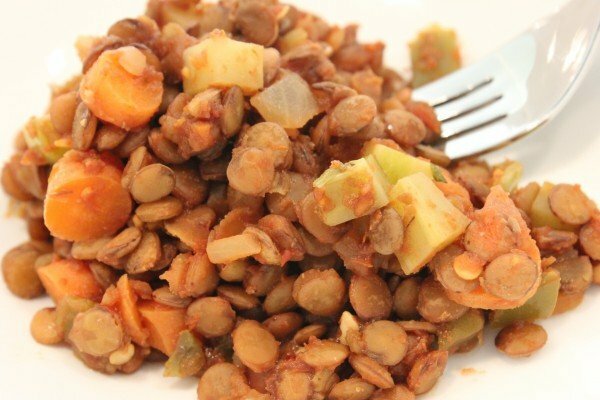 Not that the lentils on their own are hurting in the fiber department. And planned leftovers are music to my working mommy ears. 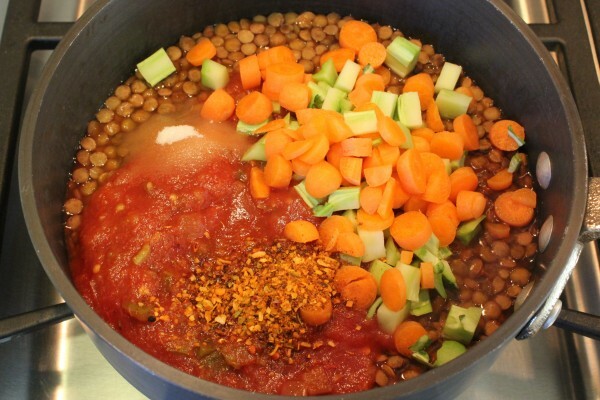 Need other one-pot meal ideas? From my last post about going to the doctor, specifically going to the gyno, thanks for chiming in about your own experiences with going and with monthly self-breast exams. Not exactly on the top of everyone’s to do list, but as I mentioned, it’s one aspect of staying healthy. Being proactive about our health and preventative care just makes sense to me given how much we all care about other aspects of healthy living like food and exercise choices. 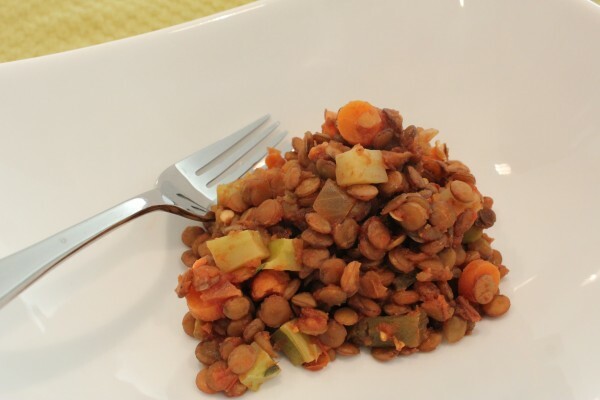 Maybe you’d like to wash your lentils down with brownies. I know some people who’ve tried beans or lentils in their brownies. I haven’t gone that far, yet. Raw Vegan Brownies are as far as I’ve gone. 1. 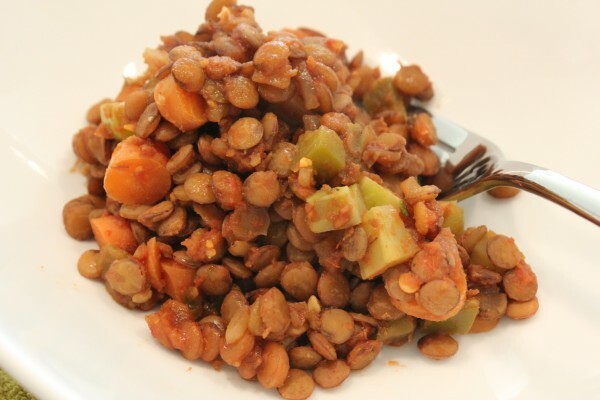 Do you like lentils? 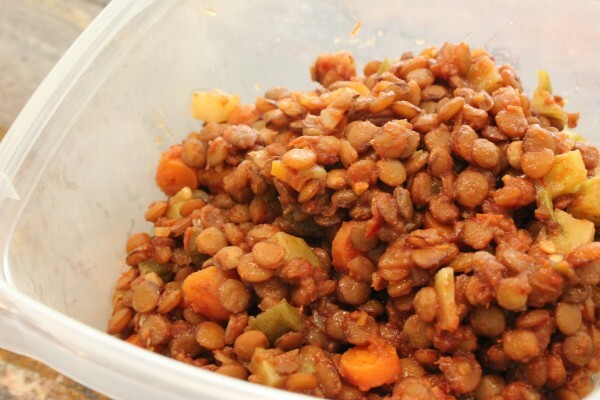 I used to love buying lentil salads at WFs. Haven’t wasted money like that done that in years, though. I just make my own now. 2. Favorite way to prepare them? I don’t cook with them that frequently but I need to start using them more because this was a fast, family-friendly, cheap, vegan meal. Christine has been sprouting them. That’s next on my to-try list. 3. Anything fun or exciting happen for you today? I got a package in the mail I was waiting for. Will be posting about it, soon. Hello! bkeeedb interesting bkeeedb site! This was delicious! 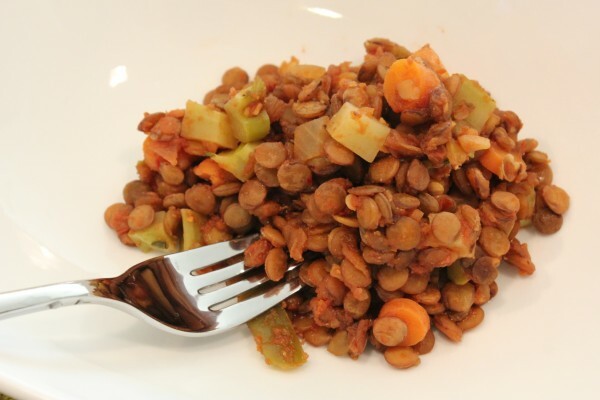 I really enjoy lentils but haven’t had any recipes that were very exciting. This was full of flavor and the hubs really liked it too! I am a little bummed because I was going to make the carribean PB rice dish but made this one instead because I couldn’t find the carribean citrus mrs dash at the grocery store (I went to about 5 different places none the less!). I now will have to wait since I think I will have to order the mrs dash onlilne! I also made the raw vegan chocolate chip cookie dough balls – love them! No one could have just 1. So glad you made this and really enjoyed it and also the cookie dough balls, too! Yay for two successes! As for the arribean citrus mrs dash…don’t go out of your way for it, seriously. ANY SEASONING blend will do. Really, it’s not a biggie. The original Mrs. Dash or really any garden-variety McCormick’s, TJ’s 21 Salute seasoning, or any seasoning blend that’s not ridiculously potent with garlic or onions (and don’t pick an Indian seasoning, i.e. no curry) but aside from that, just use whatever. 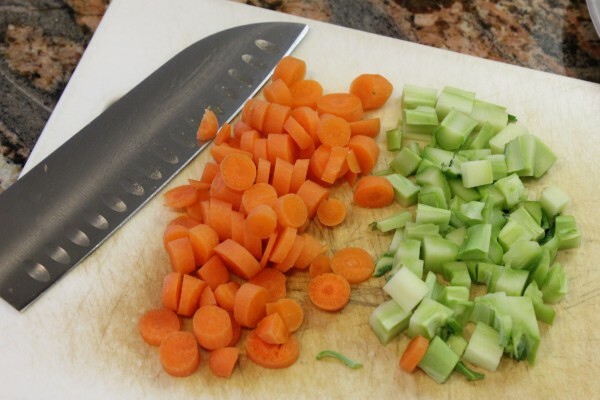 Don’t let the seasoning stand in your way of making the recipe!